Are you guys ready for summer? I am seriously vibing some summer sunshine and the beach, and so I thought this little jellyfish would be perfect for this week’s Color Snack Sunday. 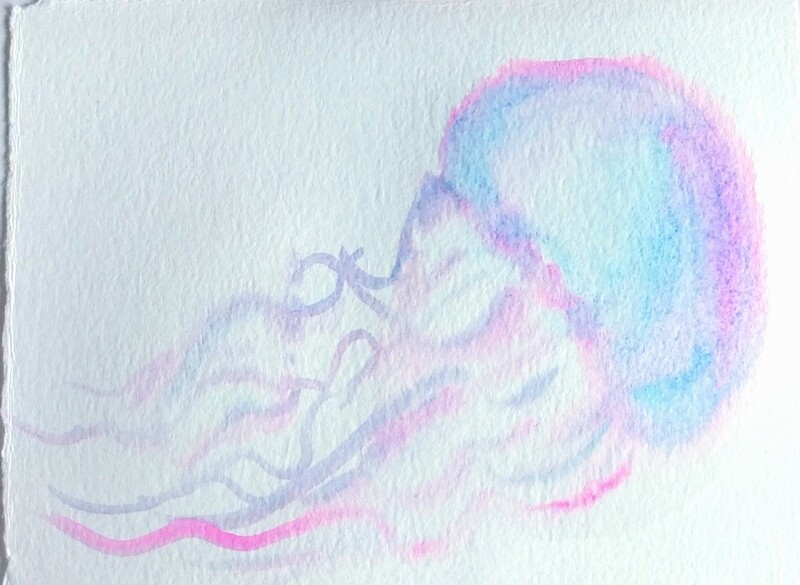 This is another sketch using the wet-on-wet technique because I wanted to give this watercolor jellyfish sketch a really soft and dreammy look. Plus it’s easy, fun and quick! This can be a little tricky, but with enough practice you will get the hang of it. It is important to make sure that the watercolor paper is properly wet, but not dripping with water. Otherwise it will not create a cool effect, but rather be super drippy. Start by adding a thin layer first and then add more if you feel that it is not properly wet. Step 2. Start sketching the jellyfish head, or body. Think of this shape as a semi-oval with a wavy line at the bottom. Don’t forget to leave some white space for your highlight, to give your shape more dimension. I am using here Cerulean Blue by Daniel Smith, but you’re welcome to use any other type of blue that reminds you of summer and the beach. Step 3. Sketch the jellyfish tentacles. Think of the tentacles as wavy lines. Some of these lines will also have additional ruffles, or wavy ridges. You can sketch these in a different color or mix your blues and pinks together to create a gentle purple (I am using Cerulean Blue + Opera Pink from Daniel Smith). Step 4. Go over your jellyfish shape with your second color to give it dimension and create a playful colorful look. Because we are working with wet-on-wet watercolor technique, the edges will bleed a little into the background. But that’s totally ok! We want that, because it gives off this dreamy effect for us to play with it. Step 5. 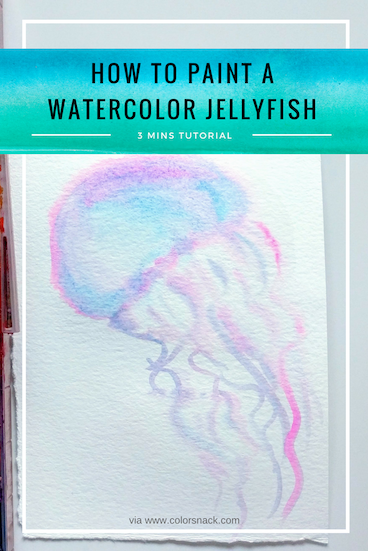 Keep adding more light layers of watercolor to your jellyfish, until you’re happy with it. Your jellyfish sketch is ready!